What a week, right? My prayers are going out to the people of Boston and West, Texas. I hope the week can end with the succesful conclusion of the search going on in Boston right now (stay safe, Beantown peeps!). I’ve been trying (somewhat successfully) to distract myself. First, you may have noticed (or not!) that The Domestic Front is looking a little different. After nearly four years with the same header, I thought it was time for a bit of a refresh. I’m a one woman show – tech, design, writing, photography – so it’s all me. Let me know if you have any feedback! Second, here are a few things I’ve found that I think you’d love, too. The weather is getting warm in LA which means I start craving Mexican food like nobody’s business. I stopped on my way home last night to pick up fish tacos for dinner (SO GOOD), and my meal plan for the week seems to be featuring cumin quite heavily. 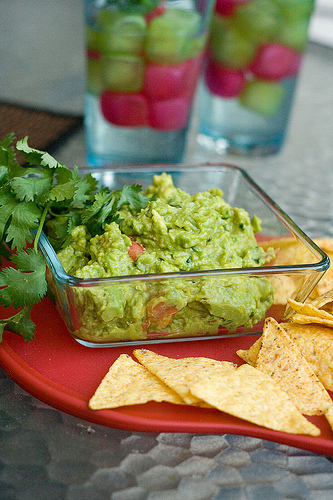 It should be warm enough to eat outside this weekend, and that means I’m going to make some of this classic guacamole. You should make some too! I’ve stopped reading the news (except for opinion pieces about work-life balance, natch. And Jonathan Gold’s restaurant reviews) and this week is a perfect example of why. I can’t take the grimness, and the 24-hour news cycle puts enough pressure on the news outlets that we get a lot of both sensationalism and misreporting (I’m looking at you, CNN). I still want to be an informed person, though – don’t you? I can’t live entirely with my head in the sand. That’s why I was thrilled to learn about The Skimm. It sends a news summary to your inbox every day, so you know the basics of current events without the speculation and sensationalism. It’s written in a very chatty style, so easy to read, but it’s blessedly free of commentary. I’m probably the last person on earth to write about this, but I loved the 100 Rules of Dinner over at Dinner: A Love Story. While some of them are clearly wrong (Really? I can think of lots of things worse than grilled vegetables) some of them are so, so, right. My favorite: “If you care about what other people think about you and your parenting abilities, it is important that your kids only ask for their water “on the rocks” at home.” It totally inspires me to write my own rules of dinner. Rules like “Parmesan cheese is almost always a good idea” and “If you have eggs in the house, you can always make dinner” and “When traffic is bad, there’s no shame in takeout.” What would yours be? Speaking of planning and list-making, I have to recommend the family calendar, Cozi. It’s an app and a web-based service, which means I can add things to the calendar even if my phone is out of batteries. You can color code activities for different members of the family, sync it with Outlook, and it even emails you your schedule at the beginning of the week. With the Nuni in Kindergarten this year, Bootsy in daycare across town, and both of us working, it’s a family salvation. And speaking of apps, I recently discovered the completely awesome site Appolearning. Both of my kids are all over both my iphone and the ipad all the time. I’m not averse to a little screen time (I mean, I write a BLOG. How hypocritical would that be?) but I want it to be educational. Now that the Nuni is in Kindergarten and reading, all those preschool apps seem babyish for her, but it’s hard to find age-appropriate apps that can actually help her learn things (that she wants to play). Appolearning is a Godsend. It has scores of educational apps, reviewed by experts (like teachers) with a numerical score and a detailed breakdown of what the app offers and the skills it teaches, with ratings on things like kid-appeal, clear instructions, value and safety/privacy. I know this is a resource I’m going to be using a lot as the Nuni grows and Bootsy gets to the point where he wants to do more with my phone than just eat it. Have a fantastic weekend, chickadees! Looking good! Can I make a small comment about the horizontal banner ad at the very top detracting from your lovely new header? I’ll have to try out TheSkimm. Thanks for the recommendation! I like how they start out every tidbit sounding chatty and but actually manage to deliver news, in a brief, but intelligently written and compelling way. Thanks so much for the kind words about appoLearning – we created it just for parents like you, so it’s wonderful to hear that you’re finding it useful!